If you remember anything about Mercury, remember that it is the closest planet to the Sun and really hot. Temperatures on Mercury get up to 460 degrees Celsius. An average temperature on Earth is about 15 degrees Celsius (although it has a wide range). The Sun beats down on little Mercury all day long. The amazing thing is that there is a side of Mercury that faces away from the Sun. Temperatures on the dark side of the planet can drop to less than negative 180 degrees Celsius. It's a whopping 640 degree temperature change from the hottest to the coldest part of the planet. The temperature ranges are a direct result of the very long days on Mercury. It takes 58 Earth days for Mercury to complete one of its days. This slow rotation affects the temperatures on the surface. Very long days allow the temperature to build for long periods of time. As if the extreme temperatures weren't enough, Mercury has almost no atmosphere. The loss of atmosphere also allows for extreme temperature changes. Mercury, like the Moon, is covered with craters. Because the planet has no atmosphere, the asteroids never burn off. Imagine if you put our Moon next to the Sun. That comparison helps you understand what Mercury is really like. Tons of space dust and tiny asteroids are always hitting the Earth but our atmosphere helps to burn them up before they hit the planet. Asteroids have hit Mercury for millions of years. Each hit leaves its mark like the ones on our Moon. When Mariner 10 explored Mercury in the 1970's we received pictures and discovered that Mercury has a weak magnetic field, but similar to Earth's because it is a global magnetic field. Scientists think the core of the planet is made of nickel and iron. This iron acts like a huge magnet, changing the way fields interact with the planet. Something else is very interesting. It seems that Mercury lost a huge amount of its mantle/lithosphere millions of years ago. It may have hit another large object while orbiting the Sun. That fact means the layer of rock that covers the core is very thin when compared to other terrestrial planets. 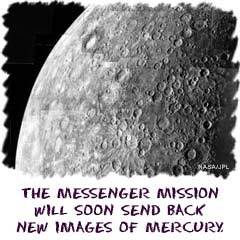 Astronomers hope to learn more about the geology and magnetic fields of Mercury when the MESSENGER probe reaches the planet in 2011. The recently launched probe will conduct scientific experiments for one year. Mercury is very difficult to see from Earth. Why? It is right next to the Sun. Mercury is rarely in the sky in a position where we can see it because it is only visible during the day. Also, Mercury reflects less than 10% of the light that hits it. Scientists use the word albedo to describe how much light a surface will reflect. The low albedo of Mercury tells you that the surface is very dark. We have been able to see some parts of the planet, such as the Caloris Planitia Basin. The CP Basin is a very old crater caused by an asteroid impact millions of years ago. Scientists have also seen long cliffs called scarps. They may have been created when the planet was cooling.